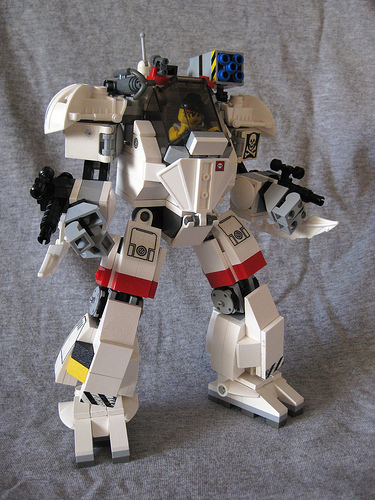 Andrew Lee (Wintermute/Onosendai) has built quite an awesome pirate mecha. He has proven once again that he is the master of sticker use, using only official LEGO stickers. The weapons compliment is very nice as well, from the arm blades for breaching space-galleon hulls to the grappling hook. There are a couple of others on his par of excellence, dasnewten’s sticker work comes to mind. Ahh, but Rob (dasnewten) uses custom stickers, not just official LEGO stickers. His sticker use is fantastic, but there’s still a difference.